Shakir Mahmood struck 86 for Ketton against Ufford Park. Bourne had to work hard before moving into their third Twenty/20 final of the summer last night (June 19). Bourne gained revenge for a Stamford Charity Shield semi-final defeat at the hands of Nassington with a six-run semi-final success over the same opponents in the Stamford KO Shield at the Abbey Lawns. Ross Keymer struck 64 for Ufford Park against Ketton. Bourne were already through to the Jaidka Cup Final (June 28 v Peterborough Town or Wisbech at Bretton Gate) and the final of the Winkworth Cup (June 22 v Woodhall Spa at Sleaford). They were struggling at half-time last night as Daniel Bandaranaike (3-50) and Mohammed Shiffron (2-21) helped dismiss them for just 113. Captain Pete Morgan top scored with 31 from 22 balls. But Bourne’s bowlers and fielders turned the game around. Spin twins Tom Dixon and Ben Stroud claimed two wickets apiece, while there were three run outs. Bandaranaike (33) and Shiffran (25) batted best, but Nassington closed six runs short on 107-9. Ben Stroud claimed two crucial wickets for Bourne against Nassington. Ketton set up a Shield semi-final with King’s Keys on a date to be arranged with a 41-run win over Ufford Park at Pit Lane in a delayed quarter-final tie. 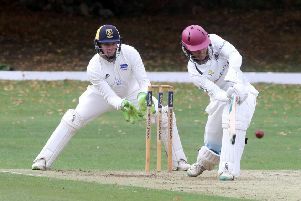 Shakir Mahmood bashed 89 and Zeeshan Manzoor thrashed 51 as Ketton piled up 202-2 in their 20 overs, but Ufford looked on course for a shock win when powering to 111-1 in 12 overs, but the departure of Ross Keymer for 64 slowed them down and they finished on 161-7. Manzoor bagged three wickets for Ketton. Bourne 113 (P. Morgan 31, T. Dixon 27, R. Bentley 21, J. Pope 3-29, D. Bandaranaike 3-50, M. Shiffran 2-21). Nassington 107-9 (D. Bandaranaike 33, M. Shiffran 25, T. Dixon 2-26, B. Stroud 2-32). Ketton 202-2 (S. Mahmood 86, Z. Manzoor 51, T. Aziz 30no). Ufford Park 161-7 (R. Keymer 64, N. Buckingham 23, E. Coopee 23, Z. Manzoor 3-31, M. Thomas 2-15).